State Children Act 1907 (WA), courtesy of State Law Publisher of Western Australia. The State Children Act came into effect in Western Australia in 1907. It repealed the Industrial Schools Act 1874 (and related Amendment Acts of 1877 and 1822) and the Industrial and Reformatory Schools Act 1893. Its stated purpose was 'to make better provision for the Protection, Control, Maintenance, and Reformation of Neglected and Destitute Children, and for other purposes'. The Act set up the State Children Department and mechanisms to regulate the institutions and people that 'cared' for or punished children. The Act also established the Children's Court of WA and regulated the employment of children and young people. The Regulations for the Act were gazetted on 27 March 1908. The State Children Act 1907 was repealed by the Child Welfare Act 1947, which commenced on 10 January 1948. Section 4 of the Act defined a 'destitute child', as 'any child whom the Children's Court found had no sufficient means of subsistence' and whose near relatives were, in the Court's opinion, 'in indigent circumstances and unable to support such child, or are dead, or unknown, or cannot be found', or were out of the State or in the custody of the law. The extent of danger to which children were exposed had been brought to public attention in the Alice Mitchell baby farming case in early 1907 and this no doubt acted as a spur to reforms that were already in the pipeline. The fact has to be faced in dealing with unwanted and State children, that no system yet evolved is perfect, and the the two now known as tho institutional and the boarding-out system are both necessary to the well-being of children in their different spheres of activity. Both are responsible for failures as well as successes. Those people who have come into contact with any child that has suffered by being in an institution will naturally place more reliance in the system of boarding-out. while those who have known of cases of atrocious cruelty that have happened to a boarded-out child will lean favourably towards the institution where inspection is easier of attainment. Both systems must be judged.without prejudice. Clearly, inspection and regulation were important. An aspect of the Act which gained public approval was the appointment of voluntary inspectors. A consequence of the Mitchell baby-farming case had been the conviction of two Health Department inspectors, who failed to prevent or indeed inquire into multiple infant deaths. According to the Western Mail, the 'one danger that threatens paid inspection is that it can so easily become mechanical, whereas in the case of the work voluntarily performed for love it is lifted into an altogether different and often higher plane.' Certainly there was a belief at the time that voluntary inspectors had made a large contribution to the success of the South Australian legislation upon which the State Children Act was based. Section 15 of the State Children Act 1907 enabled certain organisations to receive a subsidy for some of the children accommodated. (1) The Government Industrial School at Subiaco, established before the commencement of this Act, is hereby declared to be a Government institution within the meaning and for the purposes of this Act. (2.) The orphanages and industrial and reformatory schools established before the commencement of this Act, specified in the Second Schedule, are hereby declared to be subsidised institutions within the meaning and for the purposes of this Act.' 'Section 15. SECOND SCHEDULE. The St. Joseph's Roman Catholic Orphanage, Subiaco ; the Church of England Girls' Orphanage, Adelaide Terrace, Perth ; the Swan Boys' Orphanage, near Midland Junction ; the Clontarf Roman Catholic Orphanage, near Victoria Park ; the St. Kevin's Roman Catholic Industrial School, near Leederville ; the Red Hill Industrial School, near Midland Junction ; the Salvation Army Industrial Schools for Boys and Girls, near Collie. The Regulations for the Act were gazetted on 27 March 1908. Subsidised institutions were named in the State Children Act 1907. Part 8 of the State Children Act 1907 enabled licensing of people caring for children under the age of 3 that were not near relatives. The term 'neglected child' was defined by the State Children Act 1907 (s.4). There has always been a relationship between the Criminal Code and the legislation governing child welfare in WA. 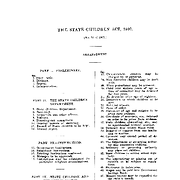 The Infant Life Protection elements of the Health Act 1898 were repealed by the State Children Act 1907, which became the principal Act for the care and protection of children in Western Australia. Children who were in out of home care were also covered by the public health provisions of the Health Act 1911. The licensing provisions for maternity homes that had been in the State Children Act 1907 were brought under the Health Act in 1918. The Collie Boys' Home was classed as an orphanage within the meaning of the State Children Act 1907. The Government Industrial School was classed as an industrial school within the meaning of the State Children Act 1907. Perth Girls' Orphanage was classed as an orphanage within the meaning of the State Children Act 1907. Redhill Reformatory School was classed as a reformatory school within the meaning of the State Children Act 1907. Salvation Army Industrial School for Boys [Collie] was classed as an Industrial School within the meaning of the State Children Act 1907. The Salvation Army Industrial School for Girls, Collie was classed as an indsutrial school within the meaning of the State Children Act 1907. St Jospeh's Girls' Orphanage was classed as an orphanage within the meaning of the State Children Act 1907. St Kevin's Industrial School was classed as an industrial school within the meaning of the State Children Act 1907. Swan Boys' Orphanage was classed as an orphanage within the meaning of the State Children Act 1907. 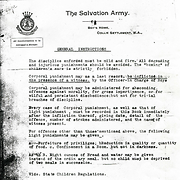 ‘General Instructions’ makes reference to the State Children Act 1907 regulations about punishment of children in industrial schools and orphanages. Sources used to compile this entry: Annual report of the State Children Department, State Children's Department, [Perth, W.A. ], 1908-1927. 1909, p.3. ; 'Care of the Children', Western Mail, Charles Harper, J.W. Hackett, James Gibey, for the Western mail office, Perth, 25 January 1908, p. 39, http://nla.gov.au/nla.news-article37573895; To Remove and Protect: Aboriginal Lives Under Control [website], 2010, http://aiatsis.gov.au/collections/collections-online/digitised-collections/remove-and-protect; Battye, JS, The Cyclopedia of Western Australia (1912), Hesperian Press, Victoria Park, 1985. Vol 1, p.504. ; Worral, Jennifer, 'Baby Farming', in Gregory, Jenny and Jan Gothard [editors] (eds), Historical Encyclopedia of Western Australia, University of Western Australia Press, Crawley, W.A., 2009, p. 118; Law Research Service, Melbourne Law School, Law Library, The University of Melbourne. 'Find and Connect Project - Western Australia Legislation', 13 December 2013, held in the project files at the University of Melbourne eScholarship Research Centre.